How to Add Web Push Notifications to Your WordPress Site? If you are looking for ways to improve traffic to your WordPress site, web push notifications can be a great option. They are noticed to increase the number of return users, and to enhance the user engagement on your site. Push notifications will help you notify your audience when you publish new content, or even when you update existing content. In this article, we will look into the process of setting up web push notifications on your WordPress site. For this, we will use the popular plugin OneSignal. 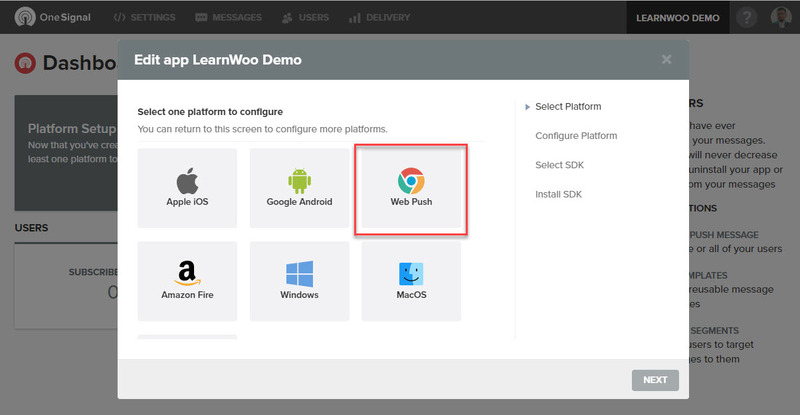 After setting this up, your audience will be able to receive web push notifications from your site on different devices and browsers. Push Notifications offer some marked advantages when you try to communicate with your users. Here is a quick look at some of these aspects. In many cases, email communication digress and hence it won’t always be able to keep up the user’s attention. On the other hand, with the scope for precise messaging, web push notifications can convey the message you intend to share swiftly and clearly. According to experts, push notifications tend to provide a better click-through rate compared to emails. The average time spent on the site after reaching through push notifications also tend to be more. Enhanced user engagement is an important measure of success for any website. Push notification enable better engagement from customers compared to other popular strategies like newsletter subscription. For eCommerce store owners, push notifications can be an important aspect that can increase sales and conversions. This is because of the extremely targeted nature of these notifications. When a prospective customer reaches your product pages through push notifications, the chances of them making a purchase are higher. When you regularly engage customers through web push notifications, chances are better to retain them. YouNow, a live stream broadcasting site has asserted that push notifications has helped them a lot in re-engaging customers on their platform. 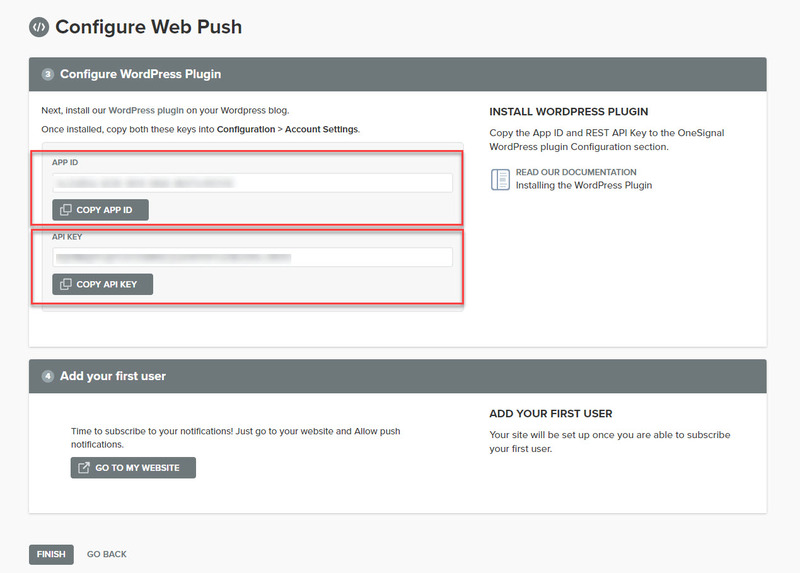 How to set up web push notifications on your WordPress site? 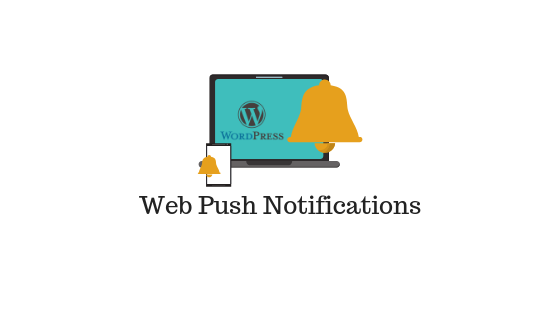 We will describe the process of setting up web push notifications on your WordPress site step by step here. First, you have to install and activate the OneSignal WordPress plugin on your site. 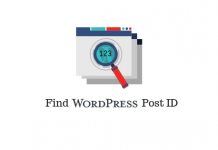 Install and activate the OneSignal WordPress plugin to get started with the process of setting up web push notifications. On the plugin settings page, you will see a Configuration tab, where you have to enter App ID and API Key. To find the App ID and API Key, you need to login to the free OneSignal account. You will find these details in your OneSignal Account. Log in to your OneSignal account. If you don’t have an account, you can create one free of cost. When you log in first to the OneSignal account, you will have to create an app. You need to add an app on your OneSignal account to set up notifications. Click the Add App button to create your app. You can enter the name of your app here. Once you add the app, you have to configure the platform set up. Since we are enabling web push notifications, we will choose ‘Web Push’ in the next screen. If you need to configure more platforms, you can always return to this screen later and manage to add more. You can choose the platform you want to configure here. Now, you need to choose the integration. 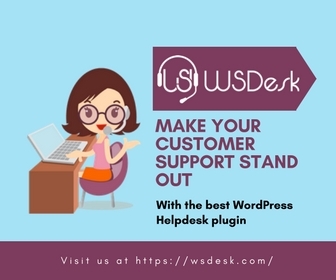 There is a specific option for WordPress sites. So you can choose the option “WordPress plugin or Website builder” here. A CMS list will be displayed now, from which you can choose “WordPress”. Followed by this, you have to enter your website set up. Enter site name, site url and upload a default icon to be displayed with the notifications. Click the Save button after entering these details. Enter the details of your website. Once you click the Save button, you will find the App ID and the API Key on the next screen. Copy both details. Now go back to your WordPress site and add these details in the respective fields. Click Save and you are done! Enter the App ID and API Key on the respective fields in the plugin settings. On the frontend of your site, now you can see a notification icon. Your users need to click this icon and Subscribe. 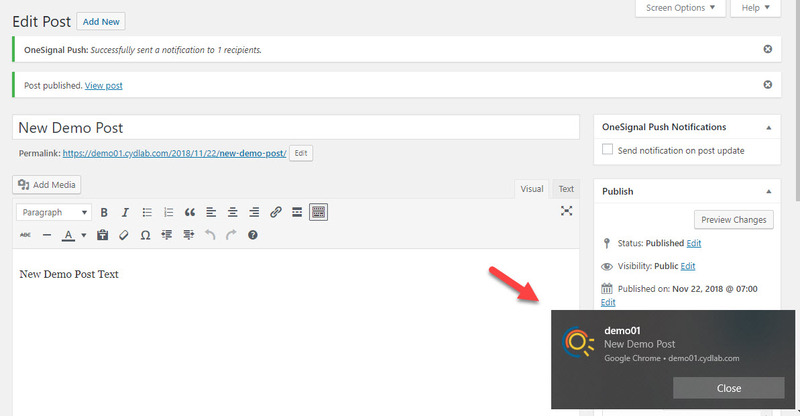 You can see the notification icon on your WordPress site’s frontend now. Every time you publish a new post, push notifications it will send push notifications to all your subscribed users. The set up of Web Push Notifications using OneSignal plugin is now complete. OneSignal is a popular option to set up web push notifications on your WordPress site. Let us look at some of the features that make it a preferred choice of many website owners. You can set up OneSignal notifications on your website in a matter of few minutes. The ease of setting up is a major reason behind the popularity of the tool. You will be able to measure the impact of these notifications in real time. OneSignal allows monitoring of the conversion rate of your notifications and emails. It is an easily scalable solution. Depending on the rising number of users, you can choose an advanced pricing plan. It offers simple options for A/B testing. You will be able to send two different set of messages to a small group of users. Depending on the results, you can choose to send the better one to most of your users. You will be able to schedule the notifications based on the personal preference of your users. It allows you to customize the messages and send them at an ideal time suitable to each user. You can set up the notifications on your site and not worry about it after. The flawless automation of OneSignal would ensure that the notifications reach customers in the relevant time. OneSignal offers advanced features that helps it stand out from competition. Features such as segmentation, automatic/triggered notifications, a notification delivery API and detailed reporting tools are particularly useful for website owners. 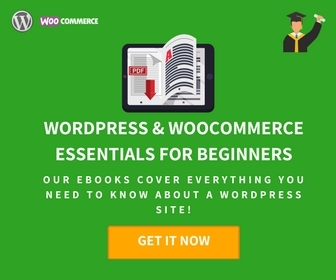 Here is a list of some of the popular tools other than OneSignal that you can use to set up Web Push Notifications on your WordPress site or WooCommerce store. PushEngage is another popular service that will help you with browser push notifications. It will send personalized notifications automatically and assists with automatic segmentation as well. The platform supports all notification enabled browsers including Chrome, Firefox, Safari, Opera, etc. PushEngage is another popular option that offers a great range of features for Web push notifications. You can send custom messages to customers who abandon their Carts on your eCommerce store. With a single click, you can configure this auto trigger feature to send abandoned cart notifications. Segmenting your users based on a select set of parameters would enable you to send more targeted notifications to your users. PushEngage offers automatic segmentation where customers are segmented based on the url they came from, the device they are using , or the location they are browsing from. While setting up a schedule for notifications, you will be able to selectively include or exclude any of the segments that you created. Overall, this approach is very effective in improving your click-through rates. PushEngage offers great features to measure the effectiveness of your notification strategies. It gives detailed funnel analytics to help you understand the specific patterns of your subscription rate. You will be able to understand the performance of individual notifications as well. It also provides a report based on the geo-location of your customers as well. You can send notifications based on a range of actions your users perform on your site. An action could be a click, a download, or viewing a video, bought a product, etc. Interestingly, you can set a limit on the number of notifications a customer gets from you on a single day. Automatic notifications based on customer actions can help a lot in improving the engagement and conversion rate on your store. PushEngage supports multiple browsers like Chrome, Firefox, Safari and more. You can use Google Analytics data to understand the preferred browser of your users. You can add PushEngage to your WordPress site easily with the help of their plugin. They have a free plan that you can use if you have up to 2500 subscribers. The paid pricing plans start at $29 for the Pro version. You can schedule a demo with them or start a free trial of one of their plans if you are interested to try it out. PushAssist is a popular service that will help you reach out to your customers and re-engage them on your website. It supports multiple browsers and help you create personalized messages to target them better. As you increase the number of loyal customers on your site and enhance engagement, your conversions too will see a boost. 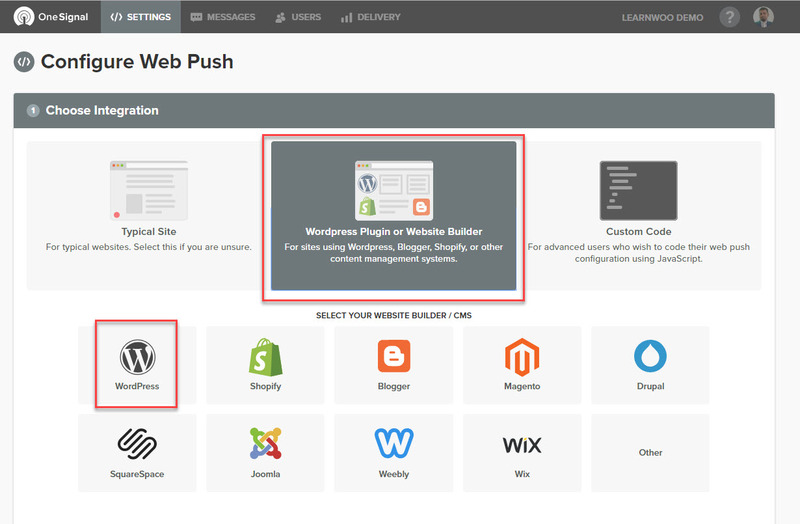 PushAssist offers intelligent options to set up web push notifications for your website. Here is a list of advanced features that you will find with PushAssist. It helps you track the responses of your customers who are receiving push notifications. When you know the behavior of customers real time, you will be able to decide your next approach accordingly. You can create multiple set of users based on their purchase patterns, location, browsing habits, etc. You will be able to schedule notifications based on a chosen date and time. Once you are more aware of your user’s browsing patterns, this can be very effectively used without hampering customer experience. Similarly, you can also understand the preferred platforms of your customers and accordingly create campaigns. PushAssist supports notifications in multiple platforms. They have a free plan with a subscriber limit of 3000. You will also find premium plans starting at $9 per month. Depending on the number of subscribers you have, you can choose a suitable plan and use it accordingly. PushCrew is another great option to set up Web Push Notifications on desktop and mobile. Trusted by over 10000 customers, this one you set up in a matter of minutes. As expected it supports multiple browsers and ticks all the right boxes in terms of features. It should help you re-engage users and customers on your site in a more targeted manner. PushCrew too offers a great set of campaigns that you can create to specifically target users who abandon their carts. It should help in increasing the revenue share of your store. With PushCrew, you can create notification campaigns in a more targeted manner with the behavior based approach of PushCrew. You will be able to provide notifications at various stages of a customer lifecycle more appropriately. You can make use of customers’ browsing patterns, geo location and other actions for targeted campaigns. The usage of elements like emojis and large images can capture the attention of your audience more readily. You will be able to direct customers to the desired pages on your site more effectively this way. Without any additional coding, you will be able to segment users, and create suitable campaigns for each. PushCrew offers you a chance to test your messages before setting up notifications. Based on the response of the test user group, you will be able to finalize the message for a particular campaign. You will find a free plan for up to 2000 subscribers. The Premium plans start at $18 per month, which you can upgrade according to your requirements. 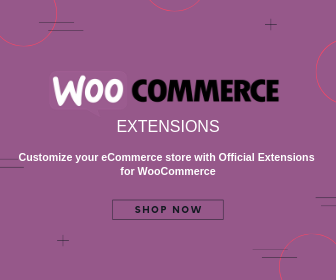 How to engage customers on your WooCommerce store?